Home Blog Zabbix 3.0 is here! Here it is! The expected and desired Zabbix 3.0 is here with the fount of new features. Let’s skim them over and put them in practice. What were you awaiting the most? The frontend in 3.0 comes with a more modern design, being now more convenient and easier to use. The UI is now cleaner with some usability improvements, for example, Users section has been split into User groups and Users. Plus, all the minor adjustments, like the change in font face and size, lead to a more lightweight and user-friendly frontend. As regards a more modern appearance of Zabbix 3.0, now you have many themes for choice: the original light is a default theme, but you might also like the stylish dark. Encryption of traffic between all Zabbix components (server, proxies, agents and command-line utilities) protects from intercepting of data. Encryption also provides authentication – only components with trusted certificate or pre-shared key can take part in communication. The authentication is mutual – e.g. not only Zabbix server examines agent’s certificate but the agent also can be configured to examine server’s certificate issuer and subject. Encryption is optional and configurable for individual components (e.g. some proxies and agents can be configured to use encrypted communications with server while others can use unencrypted communications as before). Problem prediction long before they occur – in Zabbix 3.0 this will turn into reality. Some say, that even in 2016 disks are still filling up… To prevent applications suffering from free disk space shortage, Zabbix can predict when this situation is going to happen and warn in advance. So that one can add more disk space just in time before it really becomes an issue and causes any damage. Future behavior of the monitored system will be determined based on the historic data. Plus, you can choose appropriate interval and forecast horizon. Just see the example below, where Zabbix predicts how soon file system on /home will be full looking at the last hour values. You can find a complete list of new features here: http://www.zabbix.com/whats_new.php. 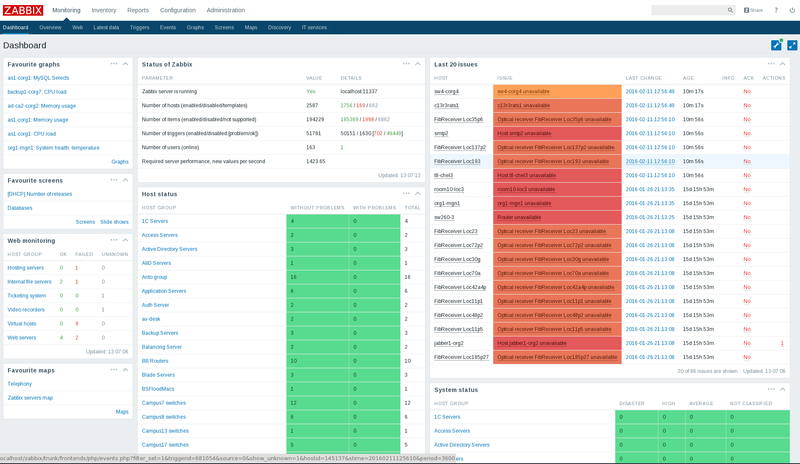 Quadrata has made everything ready to support Zabbix 3.0! Contact us if you need any help!